Poly steel roller chain is a specially engineered roller chain that is designed for applications that require a light weight, highly corrosion resistant roller chain that can operate in a broad range of temperatures. 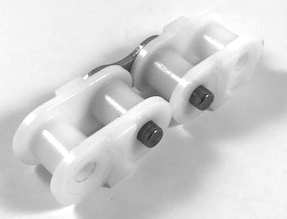 For standard poly steel applications you can use the standard poly steel roller chains (pictured in the top left) and for food grade applications use the food grade poly steel roller chain (pictured in the top right). Our poly steel roller chain consists of two main components: a polyacetal inner link (roller link/ photo above on the left) and a premium 304-grade stainless steel pin link (outside link/ photo above on the right). These components are then assembled as per the photos above to create a complete poly steel roller chain. This combination creates a roller chain that is self lubricating, extremely anti-corrosive, higher strength than solid plastic chain, and can operate in a wide range of temperatures (-200°F to +180°F). These chains are in stock in ANSI Sizes #25 - #60, but additional sizes can be manufactured upon request. When it comes to choosing a sprocket for your poly steel roller chain we recommend using a plastic sprocket. We keep a full line of high quality nylatron, UHMW, and nylon plastic sprockets in stock. Refer to the chart below for the in stock sprocket size. 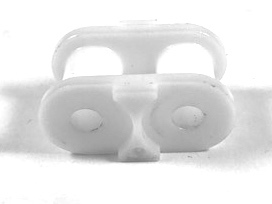 Note: ANSI 80 plastic sprockets are also available from stock. To get a quote or for additional information, please contact our sales team at sales@usarollerchain.com or call (407) 347-3519.